Thanks! It is a fun combination, and a little spicy for me! 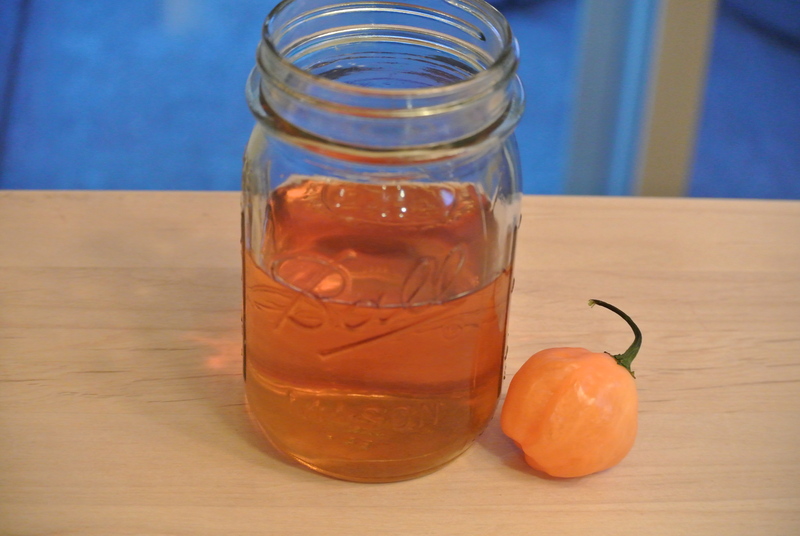 Wondering about making habanero bitters so I could make the drink at home, but your whiskey would get me there in a different way. Wow! Liz, that cocktail sounds very intriguing (and scary at the same time)!! But really, if you’re game… you should try making them and replicating the cocktail. Sounds like fun! Thanks, this is a fun drink… really hot! But also a touch of sweet honey. I could use about 3 shots of this right now – I am so sick and I bet this would make me so warm and comforting! A friend of mine just started a cocktail blog and she also owns Yumgoggle.com which is a food site. If she doesnt have a section for liquor I bet she starts one soon – you are going to have to start posting your fusions! I swear your stuff is so good – it needs to be seen by everyone! Go here http://www.yumgoggle.com and search under beverages! Hi Kelli… wish I could have shared with you! I’d make you a glittery habanero cocktail anytime! I’m loving this, esp as a gift idea! Keep em coming! A sparkly wine with gold leaf. Blue Nun was famously known in the UK in the 80’s as the blandest of bland wines popular with youngsters who’d never tried wine before. I’ve no idea if it has changed at all. I am squinting and tearing up right now because I just wiped my eyes with hands that infused tequila with habañero peppers earlier today! And I washed them about five times. Love your flavor combination here, Alicia. I completely dig the added burn in a cocktail! Late to the game but I love this recipe. I may try it soon! The closest I’ve come to it was making a ghost pepper infused bourbon. I grew my own ghost peppers a couple years ago and needed ways to use them. So I sliced one in half, took a bottle of Old Grand-dad (86 proof), and dropped the halves in for about 24 hrs. The results were very flavorful but I haven’t found myself using it a lot because it’s so damn hot. After reading this recipe, you got me wondering if honey and spice might make it more drinkable. 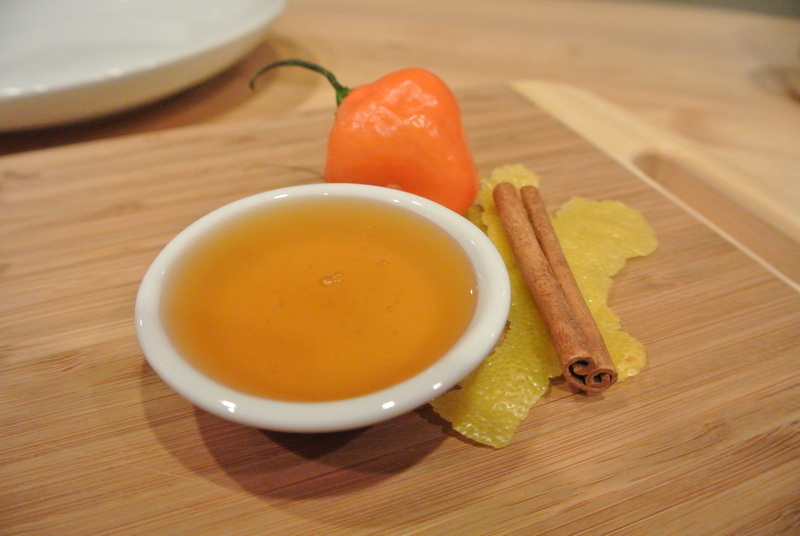 Ooh… I have never worked with ghost peppers, but I think they are much more spicy than habaneros. Also, infusing into the honey for a short while helps limit the heat. But this is still very spicy… I don’t think it is for everyone! Looks yummy! 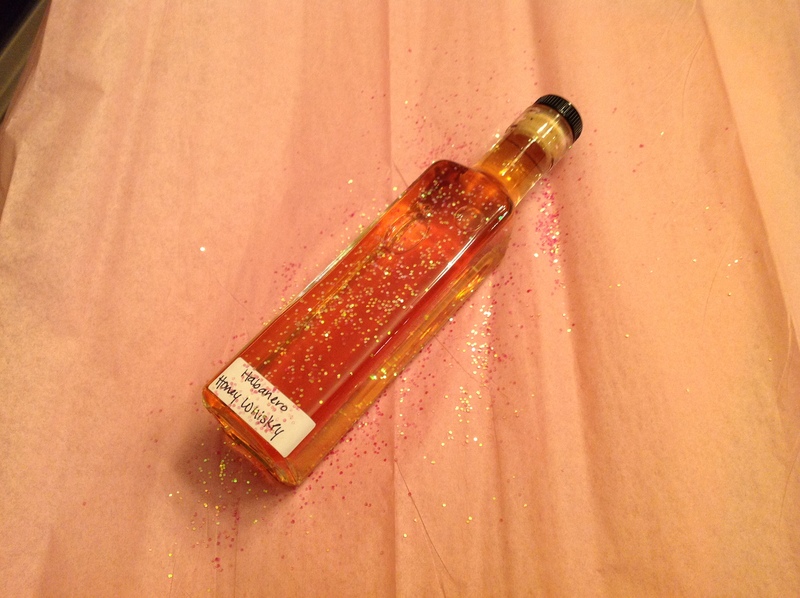 I too wondered if you were going to add glitter to the infusion, but the sparkly bottle must have made a lovely gift. I know a couple people who only drink vodka after pouring it over a long curl of lemon rind and slivers of green peppers. Thank you! I will really need to look for some edible glitter! Alicia what kind of bottle did you use to pour the whiskey into, the one at the end of the post. Love this! The hotter the better but don’t forget to wear gloves!! This may seem like a stupid question but I’m new to the whole process of infusing alcohols and I was just wondering if infused liquor goes off? Does it have a shelf life? just did my own variation on this. Used chilli peppers instead of habenero. Came out great and spicy. If you make this recipe as directed, it does not need to be refrigerated. 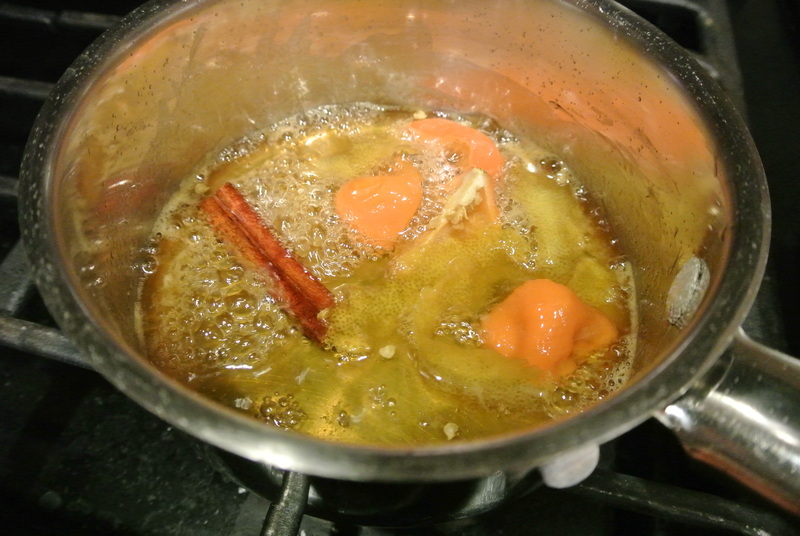 Oh man, just made this, can’t wait to try it/give it to my sick brother to help with his cough and congestion! I am a little confused, do you really only use 1-1/2 OZ of water or is that a typo? Sorry for perhaps a newbie question: At the end of the process of simmering the infusion ingredients, straining and adding to the 1 cup of whiskey that sits for 1-2 days, that volume only amounts to about 1 cup of infused whiskey. Do you then return that to the original bottle of whiskey or do you have to scale up the process to make larger batches? Thanks so much! Plan to start it tonight! Sorry for the delay. Did you make it? You can totally scale this up for a larger batch. I just put the liquid in a small bottle but it’s up to you how much you want to make. How much does this recipe make? Thanks! Hello, what brand of Whiskey did you used? I often use Jim Beam for bourbon infusions because it is inexpensive and tends to allow the infused flavors to shine. But feel free to use any brand you like. I prefer to keep the better whiskey for drinking straight. But many prefer to infuse Makers Mark or better.